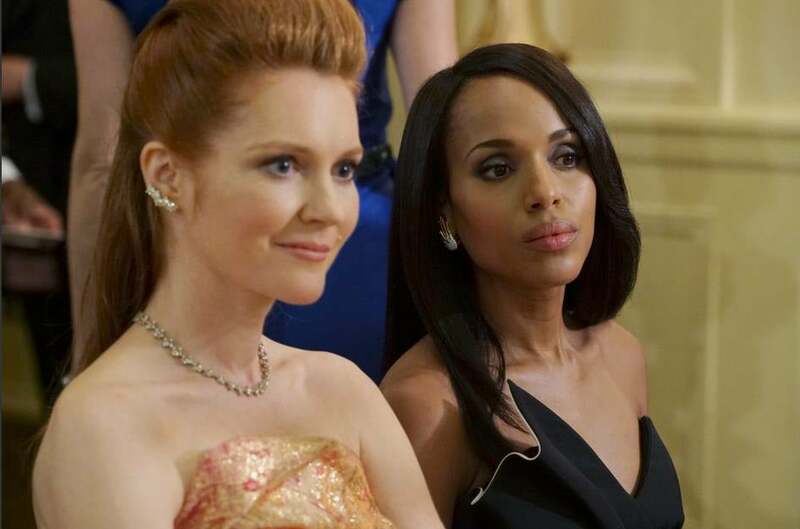 Olivia rocked the Scandal world last night with one simple word. Olivia Pope doesn’t do shame. She can walk and talk fast and solve problems quickly but when Sally Langston started waving around incriminating photos of Olivia and Fitz on her political show, Olivia bolted and even took on a client on Thursday night’s Scandal. That’s right. For all those fans who have been missing the case of the week, Olivia and the gang got their hands dirty and gave Olivia the distraction she so desperately needed in the form of a spoiled little rich boy (guest star Josh Brener, Silicon Valley) accused of killing his dad. She even made time for a little red wine. Meanwhile, over at the White House, Mellie was demanding apologies from Fitz, Vice President Susan Ross was judging her boss for his infidelities, Abby was swatting away press the best way she knew how and Cyrus was watching the whole thing unfold on his TV and laughing. Thankfully, when he caught his breath between cackles Cyrus reached out to Abby and told her to “be the adult” and make Fitz do what she needed him to do. So, that’s what Abby was doing when she brought back Mellie. But smart fans have to wonder, why did Cyrus really help Abby? In the end, Jake came to Olivia’s rescue again and even gave her a little sympathy spooning, Olivia and Jake figured out Gavin really did kill his dad and called the cops, Quinn forgave Huck and said she’s just as messed up as he is and Abby figured out that Lizzy leaked the photos. Of course, the best part of the episode took place in the last minute when reporters and camera crews chased after Olivia and asked her if she is Fitz’s mistress and to everyone’s surprise, maybe even hers, she said “yes.” Twitter couldn’t get enough and unleashed some of the funniest gifs in existence. Other high points – but can anything top Olivia’s “yes”? – include the sistahs in the diner taking selfies with Olivia, Quinn coming to the door with a gun to help Olivia lay low, Fitz’s voicemail message for Olivia and Quinn explaining that the only reason Gavin got bail was because of his race and wealth. Aretha Franklin’s “Do Right Woman” before Olivia’s bold move was a great touch, too. You can never go wrong with Aretha. Low points included Fitz asking Mellie to come back, Quinn and Huck fighting, no one calling out Sally (Hello! She killed her husband) and the second week of not seeing new cast member Cornelius Smith Jr. Please tell us he’s going to be a gladiator? What did you think of the “Yes” episode of Scandal? Weigh in below.